Rick Simpson Birding: This blog is suffering neglect. 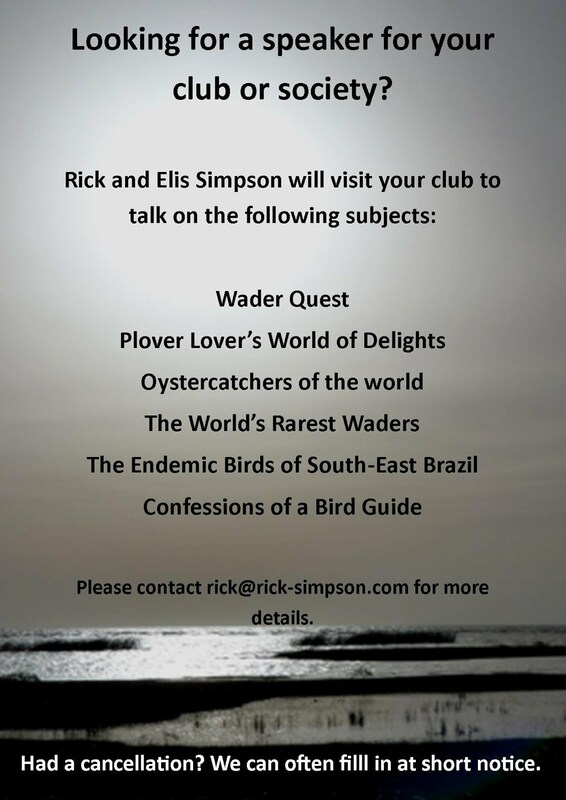 It is not because of a lack of affection for my old blog, I love it dearly, it's just that while we are travelling we barely have the time or opportunity to do what we want to on the Wader Quest blog, never mind having a bit of fun on this one. Isn't it funny how work always seems to come first! So, what shall we talk about? We've done a bit about Africa, but hardly scratched the surface, a brief mention of a day in New Zealand but nothing about Australia, and now we have Brazil and Chile to cover. Something tells me I'm going to be busy for a while. Here are some striking birds from Australia to start us off. (You'll see no waders here, they're all on the Wader Quest blog.) Starting with a pair of trillers, these are Varied Trillers and we think we have a male (behind) and female in the shot. These birds were whizzing about the trees in some sort of frenzy and were hard to keep up with until suddenly the female stopped, trembled her wings and... well, no prizes for guessing what happened next! Coitus anticipatus! Varied Trillers Lalage leucomela, Cairns, Australia. After the event she carried on as though nothing had happened, and to be honest it was so quick it probably seemed that way! One morning on the Cairns Esplanade we came across this little ray of sunshine. Assuming this to be a honeyeater, and being yellow, we assumed that this was a Yellow Honeyeater, easy this bird identification lark. Shortly after we were treated to a huge flock of birds which, although not shown in the field guide in this plumage and not being with adults, we later confirmed that our immediate thoughts that they were immature Metallic Starlings were correct. Immature Metallic Starlin Aplonis metallica. Cairns Esplanade, Australia. These guys look like they're up to mischief to me. Within minutes of these birds moving on a small parrotlet-like bird landed at the top of the same tree, this turned out to be the very pretty Double-eyed Fig-Parrot. Then came the Figbirds. We assumed these were immature males for the most part having the colouration of that gender but being heavily streaked. Then a female arrived, but no males. Immature male Figbird Sphecotheres viridus. These were a surprise, somehow I'd managed to not notice the Pied Imperial Pigeon as a potential tick from the book, so coming across a tree full of white pigeons stopped me in my tracks somewhat. Pied Imperial Piceon Ducula bicolor. Common enough for sure, but the Crested Pigeon is another stunning pigeon. That crazy top knot is a bit special. Here's another interesting pigeon, the Brown Cuckoo-Dove. This bird we found in the forests near to Cairns. Emus are curious birds, both in the sense that they are curious to look at and they are curious about us too. If you stop your car near to them they willl come and check you out, this is one of a small group that circled us before wandering off bored. This curious Emu Dromaius novaehollandiae would have been rather intimidating if it hadn't been the other side of a car window. A beautiful trio of Major Mitchell's Cockatoos, we almost overlooked these as the ultra common Galahs at first, that would have been a tragedy. Major Mitchell's (or Pink) Cockatoos Cacatua leadbeateri. A rather better known cockatoo, the Suphur-crested is no less impressive for being common. This has to be one of the most attractive birds we came across in Australia, the Red-capped Robin. We came across this in rather dry Mallee habitat where it stood out like a beacon. Another little stunner is the Mistletoe bird. This bird reminded us very much of the Buff-throated Purpletufts back in Brazil the way that it sat upright in the top branches of trees and bushes. A little more flashy than the purpletuft admittedly. Sorry this is such a brief run down of the birds we saw in Australia, but there is more to come and hopefully in a bit more depth, but for now just enjoy these images and we will dream of being back in Australia.